Jesus Christ has allowed D'Aych to use his past lifestyle as a way to encourage others that God can turn a MESS into a MESSAGE. His goal is to win as many souls to Jesus Christ as possible through music-especially those who are living a lifestyle that he himself once was accustomed to. Daniel Harris is currently the CEO of a Christian rap music company that God has allowed to flourish for the last six years ((G.O.D.D.Z. G.A.N.G./DAYCH MUSIC)). It has been a privilege for him to provide the kingdom of God and the world with music saturated with the truth about Jesus Christ. D'Aychs love for Christian rap music began when he first heard a man by the name of Michael Peace on the Bobby Jones show in the late 80's. From then on he had a true love for the artform. Since he was raised in a Christian home by a pentecostal minister, gospel was the only music that he & his cyblings were allowed to listen to when his mother was around. She encouraged her children to listen to Christian rap rather than secular rap, so D'Aych wound up falling in love with various artists in the Christian rap music genre ((A1 Swift, Gospel Gangstas, T-Bone, Prime Minister, Mike E, DC Talk, etc)). However, when she left his older brothers never hesitated to play their latest hip hop records ((Digital Underground, PM Dawn, Heavy D & The Boys, Tupac, Dr.Dre, Diggable Planets, Black Sheep, Scarface, Rakim etc)). prison bid for armed robbery, gun possession and mastermind charges. time to change, so he began converting all of his old rap lyrics into Christian rap lyrics. When he went on the yard to share the lyrics in a cipher everybody loved it. D'Aych figured if he can get brothers who are doing 20 plus years to love the new lyrics, it wouldn't be that hard to get everyone else to follow suit. What others perceived to be a failure God used as his training ground for ministry. During D'Aychs 4 year prison term he learned to spend time with God everyday. The closer he drew to God the closer he drew to him. It was there during his time of incarceration that D'Aych experienced true freedom-freedom in Christ Jesus. After serving his sentence he was released in April of 2007. D'Aych came home with a new respect for his freedom (spiritually & physically), a new mentality, a fresh anointing, and fresh material. Since then D'Aych has released 4 independent projects((The Resurrected Dead Mixtape, The All Consuming Fire Album Preview, the "ALL CONSUMING FIRE" album, and his latest release the "SUPPLY & DEMAND" Mixtape)). D'Aych has also done motivational speaking in various schools all over the midwestern region. D'Aych shares his testimony with the youth because it is his job to warn them about the pitfalls of life. If he can convince any of them to avoid the mistakes he's made & bring them to the saving knowledge of Jesus Christ through his music then he feels calling is being fulfilled. 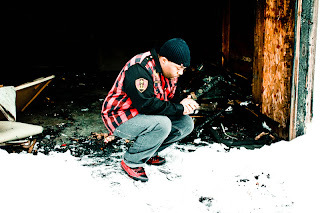 In Milwaukee Wisconsin there aren't many opportunities for Christian rap artists, so D'Aych asked God to show him how to create his own opportunities. D'Aych has done countless radio shows, festivals, and concerts but he knew that there was more kingdom work for him to do. One of the ways that people have become familiar with D'Aych Music's ministry & music is because he has held countless benefit concerts throughout the country. "The Give Your Heart Away" benefit concert was orchestrated in the fall of 2010 to help bring in food and clothing donations for the homeless. All of the proceeds went to a youth ministry he once co-directed called "Love, Jesus" ministry. Their assignment was to go into the streets of Milwaukee and feed the homeless at 5am every Sunday morning. In 2010 God blessed D'Aych to orchestrate the "HAITI BENEFIT CONCERT". Proceeds from that concert went to American Red Cross to help bring in money for the people of Haiti after the earthquake destroyed their homeland in January of 2010. On Friday July 15th 2011 D'Aych Music held another benefit concert called, "THE CARE FOR KENYA" benefit concert. 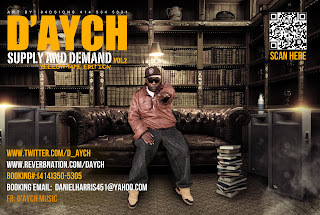 D'Aych Music is currently working with an organization headed up by pastors from Kenya Africa called the 7-4-6 project. Through this organization 7 American dollars can feed a family of 4 for 6 days. ALL of the proceeds raised at this concert went towards feeding families affected by the HIV/AIDS virus in Kenya Africa. As D'Aych Music promotes these causes God has been promoting him, and D'Aych has received phenomenal responses from all around the world concerning his ministry/ music. At the end of the day D'Aych Music's main goal is to promote the kingdom of God, and bring souls to Jesus Christ. Although his past has been one of hardships his future is definitely shining brighter than ever. 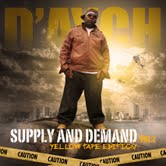 D'Aych Music's next release is due out on Nov.8th 2012 titled, "Supply & Demand V2-Yellow Tape Edition". D'Aych is currently #9 on the independent music charts, and this is just the beginning of many great things to come for D'Aych. D'Aych D'Aych is first and foremost a disciple of Jesus Christ. Secondly, I am the type of person that would give the shirt off of my back to someone who is really in need. Thirdly, I'm supporter of great music. 3375 Turning Points in Life. D'Aych The main turning point in my life was when I was sentenced to 4 years in prison. My best friend was facing life, and he wound up telling on the whole crew to cut his time short. Who would've ever known that someone who I considered a brother one day would later be one of the reasons why I'd be placed behind the cage. However, my own ignorance played a big part of that as well. Its the results of wanting to be accepted by people who truly don't have your best interest at heart. 3375 How did you get through that situation mentally? D'Aych I got through that situation through God's grace, showing respect to everybody, and not trying to be something that I wasn't. Due to the way I carried myself I gained the respect of both the inmates & the guards. I knew how to handle myself as a man, and I kept out of business that didn't have anything to do with me. I stayed writing, I stayed reading the bible, and I made plans that I am currently executing now. 3375 What keeps you inspired & motivated? D'Aych One of the things that keep me inspired and motivated is the fact that I know that my music will reach & touch millions of hearts & souls. I don't want to just touch millions of lives for the fame or for the money, I want to do it to show people that come from the bottom that it's possible. I want to show the people that are thrown away by society that when you put your trust in God, and keep working towards accomplishing your dreams anything is possible. Another thing that keeps me inspired & motivated is the fact that I want to be able to share real life experiences and perspectives that people of all walks of like can understand & relate to. My greatest rush comes from knowing that something that I've said brings light to a dark situation in someone else's life. 3375 With your music being different than your typical Gospel artist, do you feel any pressure ? D'Aych Absolutely lol. Its a good thing though, it keep me on my toes. Also, I think alot of times the older gospel artist don't understand the way that the younger artists are presenting the gospel of Jesus Christ to our generation. I don't take it personally, I look at it as an opportunity to grow into an artist that the older gospel recording artist have no other choice but to respect. 3375 Tell about the Haiti benefit concert! D'Aych The Haiti benefit concert was something that God placed in my heart when the destruction in Haiti first broke. Many times there is a lot of talk about the things that goes on in the world, but many times the people who have the ability to lend a helping hand don't. So I chose to align myself with other Christian artists and we did a Haiti benefit concert in Milwaukee and the proceeds went to the Red Cross. How can I truly proclaim Christianity if I am not making a difference in the lives of people who need it the most? Not only have we done the Haiti Benefit concert, but my music company has done other concerts where the proceeds went to other people; "Care 4 Kenya benefit concert", "Give Your Heart Away benefit concert (100% of the benefits went towards feeding and clothing the homeless), and the "Give Your Heart Away benefit concert". 3375 How important is it for you to give back to the community? D'Aych Its one of the highest priorities for me as a man, and as an artist. You have to remember that there is always someone who is doing worst than you...even on your worst day. When you look at it like that, how can you not give back? Even as God is opening doors for me I never want to forget how far he has brought me. Giving back is my way of saying thank you to God for helping me to grow into the man that people love & respect today. 3375 What’s one of the challenges you’ve faced being a new artist? D'Aych One of the challenges I face is figuring out how to balance my personal life, music and business. I don't have a team of people behind me, its just me. Sometimes things are time consuming, but I love what I do so I accept that part of the business. I haven't learned how to balance things 100%, but I'm getting better at it day by day. 3375 Why did you decide to start your own label? D'Aych I started my own label , because I wanted to be able to put out my own music without going through red tape. One of the most important things for a new artist is to create a buzz on your own, without the support of the majors. I wanted to create a buzz so heavy in the streets and online to the point where I didn't have to go to the majors...they have to come to me. Not only do they have to come to me, but they have to come to me correct. I think I'm doing a good job of that so far, but I'm just getting started. 3375 With the growth of gospel music today, What impact has hip hop made on gospel music? D'Aych I don't think hip hop has had as big of an impact on gospel music as gospel music has had on hip hop. Every form of music that's out now derived out of gospel music. All of the great icons that we admire all came out of the gospel field, so its definitely the other way around. 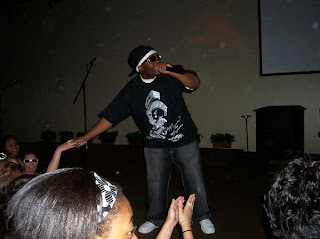 One of the first rappers that made me want to rhyme was a Christian rap artist-Michael Peace. However, I think that the culture has opened a door for brothers like myself to introduce the gospel of Jesus Christ to the masses in a language that our generation can understand. 3375 What advice would you give a new comer to the industry? D'Aych D.I.Y.=Do It Yourself. Learn the business; copyrights, marketing, promotion, publishing, networking, etc. Be true to who you are, and don't allow anyone or any amount of money to change you into something that you aren't. Treat people the way that you want to be treated, because no one wants to work with a person with a bad attitude. If God gave YOU a gift of music, don't wait for another person to validate you. Do It Yourself. Don't think that a record label means that you made it, because realistically you can have more creative control financially & musically as an independent artist. 3375 What would you change about gospel music today? D'Aych I would change the fact that some people feel that if you're not part of their click they won't help you to get to the next level. Some people see this as a competitive sport, but its not supposed to be like that. We're all on the same team, at least that's the way it's supposed to be. What some people fail to realize is that my destiny is to be one of the greatest to ever do this...period. Either way, they're going to have to deal with me, so they might as well do it willingly lol. I love everybody, but I refuse to kiss up to anyone for something that God predestined for me to have since the beginning of time. That's not my style. I'm confident in who I am in Christ, and I'm confident in the fact that God will get me to my destiny without me selling out or compromising my beliefs. 3375 What can the fans expect from you in the future? D'Aych For the duration of 2013 I'll be releasing more music videos, more video blogs, and new singles that will be leading up to the next album. My next album is officially going to be "All Consuming Fire Reignited". I am a nominee for the 2013-2014 Rhythm of Gospel awards, and I'm really proud of that. If I win cool, if not it's great to be recognized as being one of the best independent Christian rap artists from people that are outside of my region. You can definitely expect more radio interviews, magazine editorials, and national/international tv appearances. Also, there are a few sponsorships that are being negotiated, so I'll keep you posted with that. The best way to stay posted on everything is to follow me on twitter.